The speech US President Donald Trump made in the White House Rose Garden on 1 June sparked intense debate around the world. What are the prospects for climate diplomacy after the US exit and why is there no need to sing a swan song for the Paris Agreement yet? Dennis Tänzler presents four arguments for even stronger engagement in climate diplomacy. Whilst a growing number of studies are appearing that analyse the statistical relationship between climate change and violent conflict, the implications for policy makers often remain unclear. In this article, Adrien Detges points out what quantitative analyses can tell us about climate change and conflict and highlights their limitations. At a three-day workshop organized by the Stockholm Environmental Institute (SEI) and Stockholm University experts and policy actors discussed the challenges and possibilities for governing climate adaptation beyond the national level. The Kigali amendment - seeking to reduce climate-damaging HFCs - is considered a diplomatic victory. In fulfilling its pledge, India’s cooling sector has a crucial role to play. The Indian government hence seeks to cooperate with the EU to learn from their experiences, in order to advance the country’s green cooling efforts. INTERVIEW: Lake Chad – The most complex humanitarian crisis of our time? The world’s most extensive humanitarian crisis is currently playing out in the Lake Chad region, with some 17 million people affected, and 7 million suffering food insecurity. 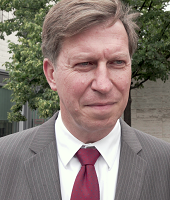 We spoke with Ambassador Hinrich Thölken, Permanent Representative of Germany to FAO, WFP and IFAD, who travelled to both Nigeria and Chad to gain a better understanding of the different compound pressures. Internationally, Australia resides in the region worst affected by climate change, a so called ‘disaster alley’. Robert Sturrock from the Centre of Policy Development argues that policy action to address climate vulnerabilities in Australia and the Indo-Pacific is not sufficient, and that Australia should offer leadership to encourage regional cooperation and prepare for climate crises. Embassies around the world are celebrating Climate Diplomacy Week, with events taking place to highlight the importance of climate action in the EU and beyond. Conferences, citizens’ debates, exhibitions, films and social media activities aim to encourage informed debate on post-Paris climate diplomacy. What are different countries doing about climate security risks? How are different countries coping with and addressing security risks emerging from climate change? In this video, high-level representatives from the US, Sweden, Pakistan, the Netherlands and Nigeria share their perspective on climate-fragility risks and tell us what their own country is doing. Featuring: Amina Mohammed, Alexander Verbeek, Alice Hill, Tariq Ghazi, and Ulrika Modéer. With a focus on ‘Sustaining peace: what works?’, the 2017 Stockholm Forum on Peace and Development from 3-4 May gathered a wide range of interesting stakeholders active in peacebuilding, development, climate change, humanitarian work and foreign policy. The aim was to identify good practices in peacebuilding interventions and approaches that can be replicated elsewhere. Climate change is an important stress factor in many regions and addressing its long-term impacts a precondition for sustainable peace. Policies to protect the environment or mitigate the negative effects of climate change can have unintended negative consequences for local communities and lead to conflicts over the use of natural resources and the focus of local development policies. In a new series of case studies, the ECC Factbook analyses conflicts in connection with conservation projects. The NATO Parliamentary Assemblies’ Science and Technology Committee drafted a new report on Food and Water Security in the Middle East and North Africa. The report underlines that pressures on natural resources and connected impacts on food production are factors that contribute to the (in-) security of the MENA region. Alexander Carius, Adrien Detges, Daria Ivleva, Raquel Munayer, Benjamin Pohl, Lukas Rüttinger, Stella Schaller, Dennis Tänzler, Stephan Wolters. Editing support by William Hull and Emily Wright.